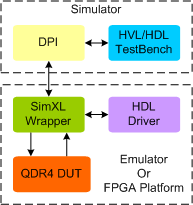 QDR4 Synthesizable Memory Model provides a smart way to verify the QDR4 component of a SOC or a ASIC in Emulator or FPGA platform. The SmartDV's QDR4 Synthesizable memory model is fully compliant with standard QDR4 Specification and provides the following features. Copyright © 2019 SmartDV Technologies India Private Limited All rights reserved.